Solar water heaters: Is a solar water heater right for you? Learn the pros and cons of solar water heaters. 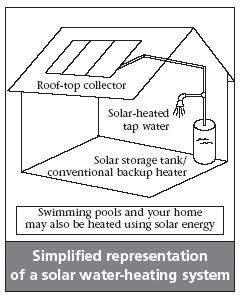 Solar water heaters are among the most common use for solar energy. They use the sun's energy to heat and then maintain a steady supply of hot water. Solar hot water heaters provide an efficient, "clean" way of providing a basic need for all homes. 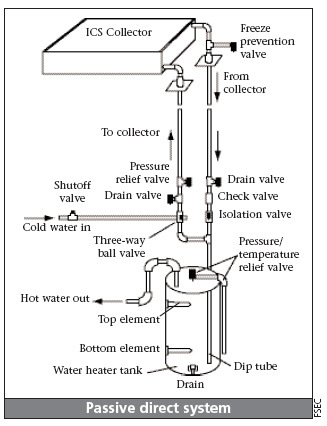 Following is a diagram showing a basic solar water heating system. Passive: This type of system does not have pumps or controls. Solar water heaters require a well-insulated storage tank. These tanks have additional outlets that run to and from the solar collector. The systems typically are either a two-tank system, or a one-tank system. In a two-tank solar water heating system, the water is preheated in the first tank before being dumped into the second tank. 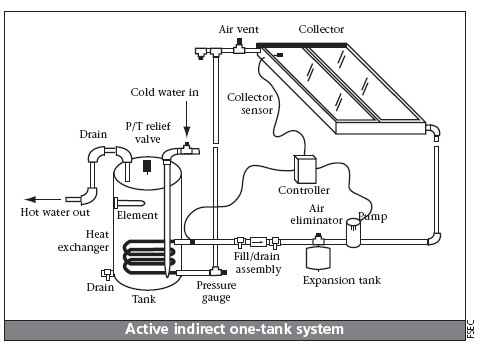 In one-tank solar water heating systems, this entire operation is combined into one tank. See the following diagram. These storage tanks incorporate a traditional heating method (gas, electric, etc.) that automatically activate in the event that there is insufficient solar energy. Flat plate collectors: These consist of an insulated weatherproof box that contains a dark absorbed plate under the glass or plastic glazing. Certain flat plate collectors use a metal or polymer absorber plate, but do not utilize a cover or enclosure. See the diagram below for more information. Integral collector-storage systems: These consist of one or more black tanks or hoses in an insulated glazed box. Cold water first passes through the solar collector where it is preheated, then the water continues on to a conventional system for reliable hot water. It's important to note that these systems should only be installed in mild climates where the external equipment will not freeze. Evacuated-tube solar collectors: These feature parallel rows of transparent glass tubes. These tubes contain a glass outer tube with a metal absorbed tube attached to a fin. The fin's coating absorbs solar energy but prevents radiative heat loss. These systems are common in commercial applications. There are two types of active solar water heater systems: direct and indirect circulation. In warm, sunny climates, direct systems circulate water through the collect and into the home. indirect systems circulate a heat transfer fluid into a heat exchanger, which warms the water. The other types of systems are passive. (See the diagram below.) Although these systems are not as efficient as active systems, they are more reliable and may last longer. One passive system is an integral collector storage system. These systems are best suited to warm climates. The other common passive system is thermosyphon. These systems utilize the natural movement of hot water rising. The collector is installed below the storage tank and the warm water rises into the tank. Careful attention needs to be paid to roof design and installation considering the weight of the system. All of these systems have their pros and cons. But one common shortcoming is cloudy days and long, dark nights. It is important to have a conventional backup system to provide consistent hot water. In terms of efficiency, tankless hot water heaters are the best bet for backup systems. Return from Solar Water Heaters to Solar Panels. Return from Solar Water Heaters to the Home Page.